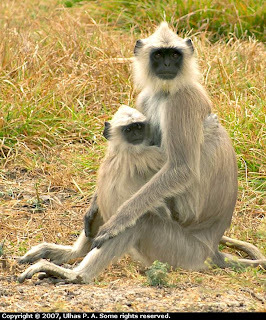 The Hanuman or Gray or Common Langur (Semnopithecus entellus dussumieri or Semnopithecus dussumieri) is found commonly in forests in South India and also in urban regions in the North. 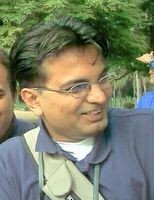 They are distributed across the sub-continent. This species has now been sub-divided into 7 species from the earlier 15 sub-species that were classified. This one is the southern race of the species and was photographed at Mudhumalai, near the Bandipur National Park. It is one of the old world monkeys and subsists on a diet of leaves and fruits. They are considered holy in the Indian mythology and are believed to be the members of the original वान्नर सेना of Lord Rama when he crossed over to Sri Lanka. The black face is attributed to Lord Hanuman getting burnt when setting fire to Lanka. These monkeys are the eyes of the forest and usually call out when a predator is around. They form an alliance with the Spotted Deer or Chital (Axis axis) and warn them of predators that they see. They in-turn are benefit from the keen sense of smell of the Chital to detect the presence of predators. Both these animals are usually found foraging together. The alarm cry of the Langur is very unique and forms a part of the experience of an Indian jungle.